Today I want to show you a chipboard mini album I recently made for our son's first pictures. I made it vertical in a calendar form for easy display. 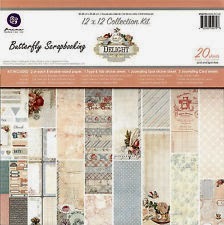 Paper collection I used is called "Delight" from Prima. I also used some miscellaneous embelishments from my stash. All pages are distressed with Vintage Photo distress ink.I wanted to keep the album very simple and clean because I didnt want to cover those beautiful papers. I really like how the album turned out.